Ah, New York City! It’s a place where you can get any type of cuisine at any time of the day, where brunch is a weekend staple, where nightlife is never ending, where the world’s cultures collide. We’ve especially borrowed a lot of traditions from our European friends. The latest? Day clubbing. Oh yes, the French have not only given us Lady Liberty, but also the permission to dance the day away while consuming copious amounts of champagne. And last weekend, we did just this. 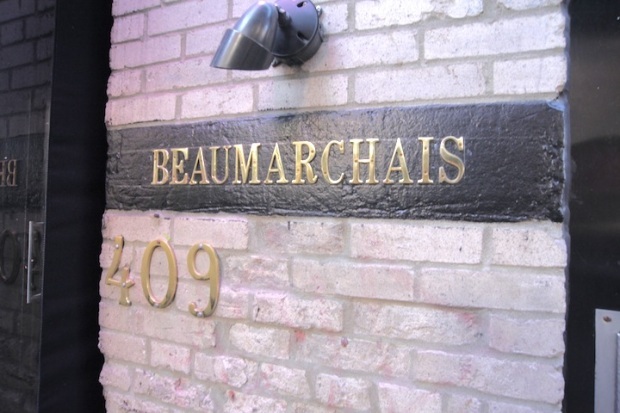 Off we went to Beaumarchais! The Meatpacking District brunch spot that appears to be a typical dining establishment in the neighborhood: somewhat trendy, somewhat European, somewhat like those places right down the street… Pastis, Paradou, Revel… but, while the standard designer-clad clientele stumble out of those brunch spots around 3pm--full and significantly buzzed--the diners at Beaumarchais get their party started. Curtains close. DJ set changes to dance hits. Bottles start flowing. Sparklers go flying. And, the room erupts. Those that were just minutes before noshing on tuna tartar and croque monsieur are now dancing on tables, where omelettes and desserts still linger. The once sun-flooded room transforms into what appears to be an underground rager in St. Tropez… but, you're still right in the middle of the city, right in the middle of the day. The food is not the reason to go to Beaumarchais with its standard brunch fare. The house cocktails, on the other hand, are an incentive. The party that ensues post-brunch, however, is the reason to go. If you don’t mind hobnobbing with the fashion crowd, bankers, expats, and well, the handful of tourists who casually just stumbled upon the place, then join the party—it happens every Saturday and Sunday. While the Statue of Liberty was given to us as a symbol of friendship from the French, we’d say the champagne-brunch party is the best gift of all. For more on ultimate brunches, tune in to "1st Look" with new host Ali Fedotowsky this Saturday after "Saturday Night Live" on NBC!